Over the weekend it was announced that Greek police had arrested two men trying to sell several artifacts near the town of Kavala, east of Thessaloniki (Kostas Kantouris Greek Police Arrest 2 With Valuable Antiquities, AP). The suspects were not named but identified as a 48-year-old Thessaloniki businessman and a 51-year-old farmer. 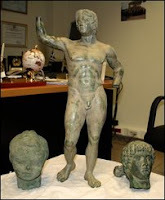 The items seized from the suspects' car and homes include a 65-centimetre tall bronze sculpture apparently of Alexander the Great dated to the 4th century BC (see picture, pretty hideous stylistically if you ask me and an awfully suspicious patina). The asking price for this alone was 7 million euros. There were also other statues, the head of a first century BC bronze statue of a boy (priced at between 4-6 million euros), another young boy's head and the head of a statue of a young man (funny how there are so many just heads around), a stone relief of a woman, two bronze coins, 11 gold coins, and one silver coin. The couple were also selling two rare Qurans. Police believe that the seized artefacts had come from Turkey, though presumably the guys that buy the coins would not even ask. (Photo Greek police/Associated Press). Collector: "Good day good sir, that's a fine display of bits of calcite you have there." Dealer: "Thank you, maybe you'd like to buy some, look at this one for example". Collector: "how much are they?" Dealer: "One for five zloties, three for ten." Collector: "Hmmm, nice price. I'll have this one... this and... this". Dealer: "Nice choice, Sir, that'll be ten zloties. I'll just wrap them in tissue and pop them in a bag. Will that be all?" Collector: "Yes, can you write on a label where they're from...."
The hall immediately fell silent. An audible indrawing of breath could be heard. The dealer paused in wrapping the specimens and looked at the man over the top of his glasses. "Where they come from, where they were dug up". The dealer stood up and glared at the man. He opened and shut his mouth. "Why do you want to know?" he asked suspiciously. All around me I felt necks craning as other tried to catch the man's words. "I just want to know where they came from, are they all from the same locality?" "I cannot tell you that"
"I can't. Ten zloties please". He held out the bag, clasping it tightly. "Well, is it from Poland or another country?" the customer asked plaintively. The dealer looked the man in the eyes: "TEN zloties please - Sir". An older man standing behind the customer sidled closer and barely audibly gave him some paternalistic advice, "leave it sir, we don't want any trouble here, do we?" At this he motioned with his eyes to two young men in denim jackets watching the scene intently from the edge of the hall by the exit. The customer reflected, nodded, meekly handed over the cash, crumpling the note into the dealer's hand, turned and walked away from his table, with the other customers staring at him. The customer who had asked. Actually, it was not like that at all. I had amused myself for a couple of hours wandering round with a lady friend picking up bits of rock priced at five to ten zloties (to give an idea of price a 660 ml bottle of beer is four zloties) and asking where precisely they were from. Oddly enough, not a single dealer I asked was at all surprised that I had asked. Most of them actually had printed labels with the name of the specimen, and the place it was from ready to put in with even common specimens taken from a grab-box when somebody bought one. I saw others writing them by hand upon a purchase. The (only) three dealers who only knew the country a mineral had come from were apologetic about not knowing any more details. At the other extreme were the dealers who not only knew the name of the place, but could tell you something about it if you asked, about where the minerals or fossils come from, who digs them out sometimes. The people who sell these items are obviously not in it for the money, but passionate about what they do and take an interest in all its aspects. Of course a variety of people go to such shows. Nine year olds who want a "really cool real shark's tooth" or a piece of "fossil dinosaur poo- eeeuww" are not going to ask where they are from. Neither are the huge numbers of people there (usually large heavily made-up females) who believe stroking crystals of certain minerals is good for their health. Even so, the dealers are prepared with the details for those who want to know, and for mineral collectors, information about provenance is regarded as important. How much of a contrast this is with what antiquity currently dealers do. Antiquity dealers claim that "many of my items are so cheap that it is too much trouble to keep check of where they are coming from". Collectors in turn obviously do not ask enough times to make it worthwhile for dealers to keep documentation. But the specimens I was looking at today were deliberately chosen to be the cheapest there, and certainly they were a lot cheaper than many "minor antiquities". I do admit however to some bias, like most customers in the know, I would have kept well away from the tables where the blood diamonds and fossils stolen from Sites of Special Scientific Interest protected by law were being sold by representatives of Russian and Serbian mafia. Perhaps if I'd asked them, I might not have learnt the sources of the items on sale so easily. But fortunately I did not see any of them. It is interesting to do a search on "collecting rocks and minerals". Here are a few random examples that came up at the top of my Google search. Rocks for kids: "Remember to keep a label with it which tells you where you collected the rock and the date". Beginners' Guide to Collecting Rocks and minerals "it is suggested that the collector permanently label his or her specimens". Collecting rocks: "A good rock collection consists of selected, representative, properly labeled specimens". Collect & Identify Rocks & Minerals "As you identify each specimen, make a label for it. If possible, write down the location and the date when the rock or mineral was collected". "Rockhounding Arkansas": "the importance of labels"
There are probably lots more, but we get the point. There were none that said, "shove them in an unlabelled heap on a shelf and pick them up when you want to imagine what it was like in olden times". In order to merit the term "collector", collectors of geological specimens are careful about labelling and provenance. The damaging no-questions-asked trade of antiquities thrives on the fact that collectors of archaeological material like coins and Roman geegaws bought from dealers seldom are. Like the touchy-feely crystal fondlers. When is a coin not a coin? "A 23-year old Shropshire woman has been ordered to hand over an historic coin after being brought to court in what is believed to be the first case of its kind in the county". She got the coin from her mother, who died shortly afterwards. They had dug it up together in their garden in Tenbury Wells when Kate was nine. The problem is, single coin finds do not fall under the Treasure Act, nor as I recall would it necessarily have been Treasure Trove when found. Neither, it seems, was Kate Harding, the person who actually found it. She was told by FLO Peter Reavil that she should surrender it to the Coroner, and she did not, so the police were called in. Apparently the object, a French "piedfort coin" is not treated by British law as a coin at all. A piedfort coin (in Medieval times, the meaning has changed somewhat since which may be part of the problem) is a coin struck with official dies but on a thicker flan. They probably served as presentation pieces, which does not mean that they were not (and could not have been used as) coins. This one wandered from France to England somehow after 1322 and is now for some reason being claimed as part of Britain's national heritage. But she will probably not get any compensation for being forced to hand it over as she did not report it to the Coroner within the fourteen days laid down by law. So when the museum gets its hands on this object, where will they keep it? In the numismatic collection, or in the store with the boxes of pottery and soil samples? There have been differing reactions to this story. Dr Michael Lewis, Deputy Head, Department Portable Antiquities and Treasure at the British Museum, hails this as "a landmark case and it sends a clear message to those who fail to report Treasure. It shows that the police and the coroners' service give Treasure and archaeological heritage law a high profile and will take proactive measures against those that disregard it". Really? Bloggers see it differently, Peter Reavill is described as a "jobsworth archaeologist" here. Coin collecting blogger lunaticg in Malaysia suggests: "She look like a victim for the authority effort to stop metal detector treasure hunter in the country". Metal detecting forums are calling this a great mistake: "the idiots involved have potentially damaged the whole business of reporting and this is indeed very bad news... [...] The fools jumping around saying this is a landmark case are celebrating an anti detecting but rather Pyrrhic Victory ...and most definitely should enjoy it whilst they can......as they sure as hell wont get any finds handed in from now-on if this is the case, as this appears to be a total legal c**k up" (Julian Evan-Hart). While I am generally of the opinion that the law is the law whether collectors like it or not, I think it is incredibly dodgy prosecuting this woman on the grounds that this is an "artefact" not a coin. I would like to know what expert opinion was called here. It is especially relevant in a situation when we have a group fighting the US government's import restrictions on the grounds that coins are not archaeological artefacts. It is probably of great interest to them that some coins are and other coins are not in English law. Michael Lewis crowing that the case allegedly "shows that the police and the coroners' service give Treasure and archaeological heritage law a high profile and will take proactive measures against those that disregard it" is nonsense. They in general do not. There have been other cases in the UK of Treasure finds and artefact hunting with metal detectors where laws have been broken much more flagrantly by metal detecting treasure hunters, none of whom ever see the inside of a courtroom, except to get a reward. This woman is not a metal detectorist, and apparently wanted to keep the coin for sentimental reasons, she reported it to the local museum where it was recorded. In this case though the law comes down on her like a tonne of bricks. Blogger "Lunaticg" suggests she is a victim of the British government wanting to get rid of metal detectorists, he presumably does not know the British government is in partnership with them. They would not prosecute one of their own, but a twenty three year old woman who got the coin from her mum is fair game. Prosecute her to show the rest what might happen if they are not good metal detectorists? Shame on the Brits. Shame, shame, shame. Let us have a look at the law. Ms Harding was done under article 8 the 1996 Treasure Act. An inquest has yet to be held to establish whether the item is Treasure (and where and when it was found). So they got her under section 8(1) which states: "A person who finds an object which he believes or has reasonable grounds for believing is treasure must notify the coroner for the district in which the object was found before the end of the notice period", 8(2) states: "The notice period is fourteen days beginning with - (a) the day after the find; or (b) if later, the day on which the finder first believes or has reason to believe the object is treasure". Right, but what Kate Harding has had at home for fourteen years is a coin. It is a round piece of metal of fixed weight, impressed on both faces with (apparently) official coin dies. If she sold it, it would be to a numismatic dealer. It is as much a coin as the unique Offa dinar, now in the BM numismatic collection (CM 1913-12-13-1), the mancus of Coenwulf (CM 2006, 2-4,1). Piedforts are discussed in the numismatic literature, though there is disagreement as to what their function was, making any such pronouncements a subjective matter - and a subjective judgement cannot be used as evidence in a court of law (or can it now in England?). Ms Harding had at home a coin, and Ms Harding is entitled to her belief that this is not Treasure, and therefore she is not bound to report it. It is a single find of a coin like ten thousand metal detectorists in Britain have at home perfectly legally and are bought and sold by them quite openly and legally on the Internet and elsewhere. Many of them not taking what they have found to the local museum for recording. But Ms Harding has the misfortune that she is not a "metal detectorist" and she did visit the local museum with this coin. Thus it is that because of something she found on her own property, she has apparently had a series of threatening letters from the museum and PAS, a visit at the police station and several appearances in court. What moral can a "finder" draw from this? 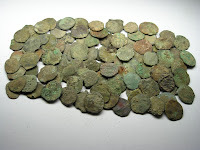 Peter Reavill, readers may remember was the FLO involved when a metal detectorist who had no permission to be where he was came in with a hoard he had found. I think we have a right to know, did Mr Reavill then go to the police then to report illegal metal detecting? How many other illegal metal detectorists has Mr Reavill shopped? Actually in Kate Harding's place, I would appeal this, on principle. Maybe the ACCG would like to start a fighting fund for her like they did their still-dormant Museum Fund. Wayne Sayles ("Exagerration") heads off criticism that the ACCG might be the source of the over-optimistic news item "US collectors to regain right to trade ancient Cyprus coins" published in the Cyprus Mail last week. He quotes a Cypriot official, Maria Hadjicostis, Director of the Antiquities Department, about the value of coins, but omits the preceding passage: "Loss of antiquities is a problem, and from a legal perspective, we treat coins just like any antiquities. There is no difference.” That after all is the crucial point, the treating by the US Cyprus and China MOU of ancient coins as ancient artefacts, which the ACCG describes as "capricious and arbitrary". 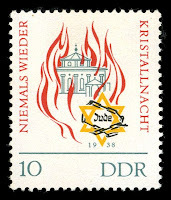 In the process of his post, Sayles once again, as is his alarmist wont, twists the meaning of Article 1 of the 1970 UNESCO Convention (it mentions "postage stamps" shock-horror). The persistence of this "Article 1 lie" among collectors is a source of constant amazement to those of us who have the attention span to make it through the actual text of the document rather than listen to the alarmists. Sayles also evokes the "bogeyman argument" and alleges that everybody is out to "destroy the licit market in antiquities" because - allegedly - this will cut out the illicit market. In fact nobody is concerned to stop the truly licit art market. The problem is the differences of opinion about what is and what is not "licit" in this industry. The people who make money out of having access to bucketloads of antiquities not unnaturally have a wider definition of what "should be allowed" than those who are concerned where those bucketfulls are coming from. The definition of what should and should not be considered truly licit and ethical however surely is a matter for wider public debate. Andrew Johnson "Britain's art of losing treasures" Independent, 28 February 2010. "A lack of funding is going to deprive the British public of several more outstanding works". Forking out thousands to treasure hunters to dig up archaeological finds under no immediate threat (except from treasure hunting) really is a huge drain on the resources Britain can muster these days for protecting the national heritage. Glittery geegaws are nice, and do their bit in drawing crowds to museums - but is this archaeology? Is this furthering the scholarly aims of archaeology? Or is British archaeology losing its taste for talking about potsherds and seeds and becoming one big treasure hunt now? 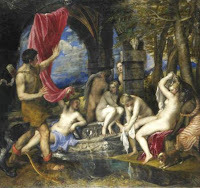 Titian's "Diana and Actaeon" was saved after a campaign persuaded the public, the Scottish government and the Heritage Lottery Fund to part with £50m to buy the Old Master's work from the Duke of Sutherland last year. Part of the problem with art works is when they are in private hands and the owner decides to sell to the highest bidder. While there is nothing wrong with that in the case of inherited works of art, does it make sense to have nineteenth century legislation in parts of the UK which entrusts the majority of the dug-up archaeological heritage to private collectors as de facto curators? Where will all this stuff be in twenty, fifty, eighty years time? How do Dug Up Antiquities Lose their Provenance? In fact if one looks at the Classical coins website, the number of coins listed in his shop are given any kind of provenance that can demonstrate they were excavated and left the source country legally is minimal. It seems that about 90% of the ancient coins currently on offer by Mr Welsh have no provenance. Some of course will have come from some old collection made in the nineteenth century and taken across the States in a waggon train bound for California. Others however will have been dug up more recently and found their way to the US in various ways and at various times. To judge by Welsh's site, collectors are not at all interested in the stories of these coins. Information on this is routinely (Welsh says "traditionally") erased as the commodities passs from hand to hand. In other cases, the information is deliberately suppressed by the dealers for various reasons. Mr Welsh is guilty of this too. 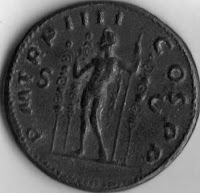 A while back I drew attention (first on Unidroit-L, possibly on Moneta-L and more recently on this blog) to some special lots he was selling of "Roman provincial" coins. The first link is broken, the second still works at the moment. I have subsequently mentioned these coins ("coins that we were able to acquire in quantity and can offer to the collector at particularly attractive prices") a couple of times here and here. So I was interested to see today that the description of where the coins in these special lots come from has been edited out. Why? Is the dealer trying to hide an uncomfortable truth when the looting of coins and artefacts from precisely Bulgaria was the subject of wider discussion? 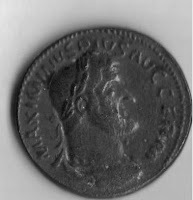 Why does he feel he can he not now tell his customers from which region of the Roman Empire these coins came from ,when earlier he was doing this on his website? Collector's reaction to "Treasure Hunting 101"
Peter Tompa obviously managed ("with some difficulty") to find his way to a library, and has now seen a copy of Nathan Elkins' JFA article discussed here earlier. Today he writes on it, predictably calling his review "Elkins' "Treasure Hunting 101 in America's Classrooms:" Propaganda or Scholarship?". The general tenor of his account of it is that the issues raised by Elkins are "propaganda" having nothing to do with scholarship. There is however a noticeable lack of a deeper analysis. His breakdown of the issues consists of a few sensationalized quotations without providing the background to them. Tompa skirts over the thrust of the article completely, which is the way that ACE sources coins for its activities. He claims that there is nothing wrong with uising dug-up coins from the Balkans because the coins that are used can allegedly openly be "bought and sold" in Bulgaria. I challenge the "cultural property lawyer" Tompa to get a plane to Sofia, buy 27 ancient Roman coins in this "open market", and bring them home. Let him gleefully declare to Bulgarian customs as he passes through the border on his way out what he has in his hand luggage and that he is going to use them to "educate" US children. Let us see another ACCG "test case". If Mr Tompa is quite sure that he and his dealer mates was right over the new Bulgarian legislation (see blog posts here of September and October 2009) let him put his money where his mouth is. I think he will find the hard way that he has been misleading his readers. It’s hard to imagine a better way of building goodwill toward the hobby, or of recruiting well-informed and enthusiastic supporters. ACE’s “Take a Roman Emperor Home with You” is one tremendously popular and successful way to spread the word about the fascination of ancient coins among those who might never have dreamt of actually "owning" one. ACCG's Mark Lehman says: "We profoundly hope these coins will serve, as intended, as a sort of "dragons' teeth" seed, sown in the hope and expectation of raising a whole new generation of collectors [...]" (the dragons' teeth of the myth as we remember were to give rise to an invincible army). Elkins discusses the ethics of the use in "educational" programmes of "erdfrische" coins which current knowledge about the trade shows will include archaeological objects illicitly excavated and illegally exported from Bulgaria. Tompa dismisses the raising of these ethical issues as mere "propaganda" - but fails to see that the ACE itself is entirely geared towards providing propaganda for ancient coin collecting. In the process, the scheme is totally avoiding discussion of the ethical issues involved in the collection of archaeological material bought on the US market. Babylonian clay foundation cone, circa 2100 B.C., that would have been embedded in a temple's foundation. The Sumerian inscription commemorates the rebuilding of Eninnu, the temple of Girsu's city god, Ningirsu. It was intercepted coming into Chicago, Illinois. A Sumerian bronze foundation cone and a stone tablet with inscriptions on both, circa 2500 B.C. to 1800 B.C. A dealer in London shipped the items to a Connecticut-based collector, and they were imported via Federal Express to the Newark, New Jersey, international airport. The items were declared as coming from Syria, but scholars determined they were of Iraqi origin. 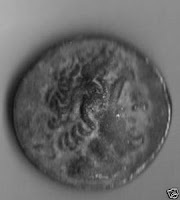 Another object was a Roman coin from A.D. 248-250, which had been left at the Houston Museum of Natural Science by a man who said he was a contractor in Iraq. Readers of the cultural property blogs will know that it has been a constant claim of US antiquity dealers that none of the material looted in Iraq after the imposition of sanctions and the subsequent invasion has been sold in the USA. Finds like these show that what these claims imply is that due to the current no-quiestions-asked market and the practice of false provenancing and antiquity 'laundering', very few people have been caught in the USA trying to import material or selling it. This is of course not the same thing. It is characteristic of these reports that very few details are given of the circumstances surrounding such seizures. No naming and shaming of smugglers then. Because of course what is important is not the "repatriation" of these objects, but catching the smugglers and breaking the chains and webs of illegal transactions which lie behind illicit antiquities and through which looting is financed. It would be nice if journalists could take this iodea on board and start questioning officials about their efforts and successes in this. Without this, the rest of their activities basically boils down to a futile exercise in public relations. The news item notes: "People involved in illegal trafficking can be sentenced to up to 20 years in jail". So, how many have been caught and sentenced as a result of US investigations of the traffic in illicit artefacts in the last decade? More to the point, how many have not been caught, how many illicit artefacts have passed through US borders uncontested while US dealers engaged in the no-questions-asked market rub their hands with commercial glee? UPDATE: Chuck Jones discusses the "murky" passage of the earrings from Iraq to Christies and the ICE. "precisely the types of treasures that ICE's Cultural Property, Art and Antiquities unit was established to identify, investigate and return to their rightful owners [...] We will continue to be vigilant about finding and prosecuting those who would rob a nation for personal gain." One really wonders about the "vigilance" of US authorities which allow huge shipments of, for example, uncleaned coins metal- detected from archaeological sites in the Balkans and Near East to pass through US borders on their way to eBay sellers in the States. Each year some hundreds of thousands of (perhaps , according to Nathan Elkins who has done a lot of work on this, even a million) ancient dug-up coins many with the earth still on them may be sold through eBay and V-Coins by US sellers. This prompts the question: how many such coins have US customs stopped at the borders this year? The 27 coins which the ACCG themselves informed Baltimore customs officers they were illegally imported? OK, but how many more? How many people in the US or abroad have been put in jail or heavily fined for involvement in antiquities smuggling into the US as a result of ICE investigations? That actually is a serious question. I presume the ICE actually have some kind of figures on this. Can we see them? How do we measure the "vigilance" of the current system in fighting the illicit movement of decontextuaalised archaeological material across international borders? One gets the impression that showy 'handovers' like this under the eye of the press are intended mainly to create the impression in Washington that 'progress' is being made. Rarely however is any mention made of what happened to the people who were caught importing illegally exported material, whether investigations were able to trace back the chain of law-breaking to its origin. In fact, as in this case, I get the impression that the artefacts in question were impounded due to an accidental dicovery in a random spot-check (or like the coin mentioned the guilt-ridden owner handed them in themselves) rather than as the result of any concerted effort or detailed investigations intended to catch cultural criminals shielded by the no-questions-asked market in antiquities which currently prevails in the USA and which groups like the ACCG are engaging coin collectors in headlong conflict with the US government in order to maintain. I suspect I am not alone in hoping that when the current "Baltimore" case is over, the ICE and related organs will turn their attention to the stockrooms and documentation of ACCG-affiliated dealers; just where are they getting all those artefacts? I think, given the fuss they've been creating, we all have the right to know. Patrick Dewhurst: "US collectors to regain right to trade ancient Cyprus coins"
In an article in the Cyprus Mail, Feb. 25, 2010, Patrick Dewhurst optimistically trumpets: "US collectors to regain right to trade ancient Cyprus coins". Mr Dewhurst, they never "lost" them. What they want is to be able to continue to trade them no-questions-asked like in the good old days back in the nineteenth century. Not exactly a brilliant piece of investigative journalism, but it has got the coin dealers excited because it is published in Cyprus. Whoopee. So who is Patrick Dewhurst and what does he stand for? I think it important and relevant to point out that Nathan Elkins is not regarded by anyone on the pro-collecting side of the issue as having much real expertise in numismatics, and is viewed as being very far from an authoritative source. If you are going to cite "evidence" please first take the trouble to ascertain that it is CREDIBLE evidence. Citation of a non-expert, highly biased source does not in any way do that. So what is the real, verifiable, independently confirmed evidence sustaining your assertion? When he was doing the research and writing on the ancient coin market in the US, Nathan Elkins was working in the numismatic department in Frankfurt University, where he conducted several seminars and other teaching and carried out research. Mr Welsh trained as an engineer. Nathan Elkins now works in the numismatic collection at Yale University, looking at what he writes one might doubt whether Welsh would have had a chance of even attending Yale, let alone working there. To my knowledge Nathan Elkins has published a number of articles on numismatic topics in peer-reviewed numismatic and archaeological journals (to find out how many you'd have to ask Nathan but includes several in Numismatic Chronicle and the JFA article). To the best of my knowledge Welsh, who dignifies his shopkeeping with the title "professional numismatist", has never published any numismatic articles in any peer-reviewed numismatical journal (the popular magazine "Celator" and a few desultory pages of so-called "educational" material on his website seem the limits of his ability to contribute to the literature of the discipline). Elkins has taken part in a number of international numismatic events where the name of the Californian "professional numismatist" was conspicuous by its absence. Somebody has to look after the shop I suppose. 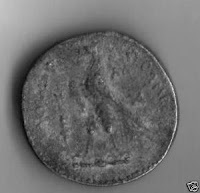 Elkins has a numismatic blog (Numismatics and Archaeology), far more informative about the academic study of coins than what Welsh offers on his "Ancient Coins" blog. I really am puzzled therefore by the ease with which Welsh dismisses his colleague as "not having much real expertise in numismatics". Nathan Elkins seems to be getting along in the discipline a good deal better and contributing far more than the embittered shopkeeper. The sources for the coin seizure tale? Well, Nathan was in Frankfurt Germany and the coins were stopped by German authorities in... Frankfurt Germany. I know Mr Elkins has had the opportunity to verify the story at first hand, rather difficult for Welsh to do from Goleta, CA. The case was also discussed in the numismatic forums. It is odd though that on those forums, there is not a word out of Welsh questioning the veracity of the reports. The case was discussed in textbox 7 on page 186 of the report Shentov et al 2007, "Organized Crime in Bulgaria, Markets and Trends" Sofia, Center for the Study of Democracy. It has also been discussed by Reinhard Dietrich [Hessisches Ministerium für Wissenschaft und Kunst] in his 2002 article "Cultural Property on the Move — Legally, Illegally" in the International Journal of Cultural Property (2002), 11 : 294-304 [Cambridge University Press]. There is a Bulgarian text (found online by Voz Earl) za kontrabandata Filcevija brat here that discusses the case, including a transcript of a letter from Dr. D. Dittrich who seems to be the head of the department that issues export permits for the Ministry of Culture in Frankfurt. It was written in March, 2001 as a reply to an inquiry from a Bulgarian official, so I think we can accept that the information there is more than just hearsay. This case was discussed in no less than three articles by Nathan Elkins which were the subject of extremely critical review a few months back on the coiney discussion list Moneta-L, but the facts of this case were not even challenged by the several thousand "ancient numismatists" gathered on that forum (some of whom presumably have had dealings with the individual to whom the coins were sent). They are a querulous lot and could be relied on to attack this point, were it one of the weak points of Nathan's arguments. The fact that it was not perceived as such seems to me to be not without significance - it too is a type of numismatic peer review. So for eleven years now this story has gone as far as I can see unchallenged by any US coin collector or numismatist. Until now, Mr Welsh publicly expresses his personal doubts as part of his campaign to prove me a "liar". On what grounds? It is only now that the CPRI has produced an overall estimate of the number of coins in private hands in the US that the number "350 000 coins" becomes significant, and only now does Dave Welsh see the need to query it on behalf of the ACCG and US coin collectors. It seems the only answer that comes into his head is to attack the credibility of those that have noticed that there is something not at all right in the US no-questions-asked market in dugup coins which he is on a mission to defend to the death. Mr Welsh informs Ancientartifactists that he has in fact gone to a Jesuit high school and then went on to a Jesuit (?) university and passed through three others before getting an engineering degree. My apologies for saying I did not think he had been to university. Engineering is normally taught in technical colleges where I come from. He then proceeds to point out that despite not having much in the way of numismatic publications to his name, he still regards himself a "better numismatist" than Elkins, so there! My post however was not about Mr Welsh, but his attempted character assassination of Mr Elkins. There is no apology in Welsh's reply to Mr Elkins, so it seems the Jesuits failed to teach him any humility, though among the useful life skills he picked up was the ability to "converse in Church Latin". Whoopee. "I can presently - from what I now know - see no alternative to regarding Mr. Barford as standing revealed as being a liar". For the record, Welsh accuses that I (1) "deliberately misrepresented the results of a study which said nothing more than that more than half of the ancient coins in question were UNPROVENANCED". It is in fact the case that the cited study says nothing of the sort. So it is not me that is misleading anyone, but Mr Welsh. Welsh advances an alternative theory (2) that I allegedly misunderstood the CPRI study "as implying that an UNPROVENANCED coin is a STOLEN coin". He suggests I "very carelessly misunderstood the nature of the study in question, and then irresponsibly wrote the inflammatory post in question without exercising due diligence". Unlike Mr Welsh, the reader will perceive that I certainly made no reference to the study itself as implying that. I think rather this accusation is due to Mr Welsh's careless reading of my text followed by his irresponsible eagerness to write the inflammatory post in question without exercising due diligence or having the common decency or sense to check his primary facts. Presumably he is discomfitted by the fact that the implications of the study's figures (intended to demonstrate something else) taken with other data implied that the US market is overwhelmed by freshly imported coins from foreign "source countries", rather than being fuelled by material from old collections as coin collectors interminably try to convince us ("Petrarch collected coins don't ya'll know?"). Even a cursory examination of the text to which Welsh refers will show that nowhere do I assert that the study itself implies that "an UNPROVENANCED coin is a STOLEN coin". In that event he certainly owes the ACCG and the coin collecting community a public apology for unintentionally (but still culpably) making these untrue remarks. If such an apology is not forthcoming, then I can presently - from what I now know - see no alternative to regarding Mr. Barford as standing revealed as being a liar. So in order to escape the verdict that I am a "liar", I have either to admit that I deliberately misled the reader - in other words that I lied (alternative 1) or apologise for mistakenly saying something I did not actually say (alternative 2). Since it is impossible to make a sincere apology for something I did not do, I guess I will have to accept that Dave Welsh has publicly accused me on the Museums Security Network and elsewhere of being a liar. Mr Welsh sells dugup coins. Mr Welsh should watch his words. Mr Welsh really should not try to engage in discussions for which he is not intellectually or emotionally prepared, because all it leads to is more puerile coiney name calling. The buyers of decontextualised archaeological material claim that by doing so they are combatting what they (incorrectly) call "cultural nationalism" (about which I will write later as it is a key element in the coineys' Baltimore Coin Stunt case papers) and engaging in the dissemination of cosmopolitan attitudes. I personally think this is just another word for "greed", but there is another aspect to this. The looted objects themselves might be the product of looting driven by nationalist agendas. Morag Kersel’s research in the so-called Holy Land has revealed the existence of some examples of this insidious process. This so-called "resistance looting" comprises people pulling sites and monuments apart to try and remove evidence of the existence of a former alien presence on their land. Kersel found evidence for this happening in the West Bank, though there was no evidence that it was being carried out in an organized way. So far she has not identified examples in Israel or Jordan. “People looted to find and destroy any evidence of occupation on their land [...] Anything with a Jewish motif or anything with a Christian motif… it just so happens that those things are (worth hundreds) of dollars on the market”, she says. So the market is encouraging this process rather than "saving" its "products". Probably many more examples can be found of this sort of process, raising the question of to what extent the no-questions-asked market in contextless antiquities can be claimed to be "combatting" (sic) "cultural nationalism" (sic) of one kind when it may be intimately related to a cultural nationalism of another kind? What kind of cosmopolitanism is it to become involved in the process of cultural cleansing? [Morag Kersel by the way is one of the editors of the Journal of Field Archaeology so vilified the other day by Peter Tompa for publishing an article about the antiquities trade]. "Half the Coins on the US Market are Looted, but Let's Ignore that, eh?" (I would like to point out that I support them, rather than they me, and if there is a God, he is clearly on our side Mr Tompa). Obviously the ignoring of inconvenient facts is in the blood of the collector of antiquities, especially dugup coins. Tompa protests that “It should suffice to state that the CPRI study Barford purports to rely upon for his conclusions does not in any way suggest unprovenanced coins "must be stolen" as Barford suggests”. Well, what a curious statement that is ! I guess Tompa should re-read what I wrote. The figures to which I refer are there in black and white, a mouse click away. The study gives a total of Greek and Roman coins in private hands ("not less than 700,000", with an upper estimate of 900 000). Tompa fails to note that the figure which shows that not less than 350 000 of them were illegally imported to US numismatic “wholesalers” through Frankfurt in the 1990s comes from another source. It seems to me that placing these two figures together brings us inescapably to the conclusion that something is VERY wrong with the US ancient coin trade. Unless of course Mr Tompa wants to postulate that some coin pixies spirited all the smuggled coins away once they came into the US? Mr Tompa's argument is a disappointing one, not at all the verbal thrusting and parrying one might expect from a Washington lawyer. He obviously thinks that, to convince fellow coin collectors that there is nothing worthy of reflection, it is enough to simply state that "the CPRI study Barford purports to rely upon for his conclusions does not in any way suggest unprovenanced coins "must be stolen" as Barford suggests”. Anyone who cares to examine my post for themselves will see that this is not at all what I actually wrote. Presumably Tompa is counting on his fellow numismatists not to actually bother going back to the original source, and confining themselves to the sort of superficial "research" techniques his own comments have in the past revealed. Good grief. Collecting coins apparently really DOES rot the brain...Over on the Ancient Artifacts forum now, Tompa's sidekick coin dealer and lobbyist Dave Welsh lifts the entire text of a post from this blog (but without giving a link and disabling the internal hyperlinks to prevent people seeing the context and sources quoted). He then writes that I "deliberately misrepresented the results of a study which said nothing more than that more than half of the ancient coins in question were UNPROVENANCED." What the...? The CPRI report says nothing about any half of anything being anything !!!!. Welsh too has failed to understand what seems to me to be a fairly simple point, that the study gives the total number of privately owned Greek and Roman coins in the US, but that total is only twice the number of coins known to have been smuggled into the USA in a short period in 1999. It's not a difficult calculation, and the point about it was not even made in a "book" but on the Internet - so that should not be too difficult to find. That makes two pro-coin collecting lobbyists from the ACCG who cannot check their sources and read plain English. What hope is there for the coineys with people like this "leading" and representing them? Pathetic. Antiquity dealer Glenn Howard (www.EgyptianAntiquities.com) on the same "responsible collectors" Ancient Artifacts forum shows it's not just coin collectors. He says it does not matter that these coins are looted.... he asks rhetorically, "What would he like to happen to all the antiquities?". What all those who care about the past would like is for objects not to be dug out of archaeological sites like Archar to fuel the no-questions-asked antiquities market, which is what these figures suggest is happening now. In his lengthy semi-articulate and ill-informed post containing just about every cliche-argument in the antiquitist book (as well as a reference to 'alien kidnapping'), Mr Howard of course confuses archaeological site protection measures with repatriation issues. Another piece of evidence in support of the hypothesis that collecting and dealing in artefacts befuddles the brain? Would a tinfoil helmet perhaps shield the grey cells from whatever it is causing this effect? The evasive text by coin collecting lawyer, Cultural property "Observer" and lobbyist Peter Tompa on his blog entitled I would rather just ignore Paul Barford, but... which I address in the post above this also discusses another point I made. I finish my original post with a series of rhetorical questions about whether collectors and dealers have thought through the potential future consequences of their refusal to do anything to clean up the no-questions-asked market and instead staging a head-on collision with the State Department and the Department of Homeland Security. Well, I drew the parallel with pot-diggers in the Four Corners area who are now having to document where the items in their collections came from. I believe that if both the government agencies being challenged by antiquity collectors in the US were doing what they should be doing, they should launch an investigation into the practices of the part of the milieu that is being uncooperative with and now even trying to overturn national and international measures to protect the cultural heritage. There is also the growing evidence now being uncovered by investigative journalism that much of the no-questions-asked trade in antiquities is financing organized crime and probably also terrorism. We might recall the US once proclaimed it was going to invade foreign countries to conduct a "war" against this, though the failure to do anything about US money which is apparently going to finance it is puzzling to say the least. Certainly it seems like there is a lot that should be looked into by the US authorities. Mr Tompa assures us that there will be no investigations of the movement of illicit artefacts in the US. "I'm not sure if this is more insulting to US collectors or US law enforcement. No, Mr. Barford, as far as I know, we do not live in a dictatorship here in the United States". No, I think that the US would prefer us all to believe that it is a society which decent and law-abiding. The import of illegally exported dugup ancient coins into the US did not stop with the 1999 Frankfurt shipments, but has been going on all the time since. The ACCG itself imported at least one batch. This is happening right under the noses of US customs, and we might well ask why. Tompa ends: "We may disagree on whether it is "okay" to collect unprovenanced ancient coins, but we should all agree that ACCG is entitled to seek judicial review of the applicable regulations". So are all antiquity dealers in the US. 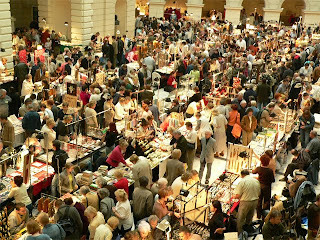 Interestingly, however, it is only the coin dealers that are expending a lot of time, energy and money to try and overturn measures that dealers in the rest of the antiques, art and antiquities trades are already applying. We hear of no "test cases" from importers of icons, furniture, paintings, antique pottery, bronzework or anything else from China, Cyprus or any of the other countries with whom the USA has an import control MOU. Despite the difficulties this produces for their businesses, these dealers are willing to responsibly abide by the law with the minimum of fuss. It is only the dugup coin dealers that are rocking the boat and ultimately going to spoil it for everyone. In this blog is discussed the evidence produced by a new study of private holdings of Greek and Roman artefacts in the US produced by the Cultural Property Research Institute. This indicates that over a half of the ancient coins currently in personal collections of US ancient coin collectors are demonstrably recently and illicitly imported looted archaeological artefacts. That seems sufficiently shocking to be worth stressing - maybe it will give collectors and pro-collecting journalists pause for thought. Especially as there is ample evidence (discussed elsewhere on this blog and by other authors) that a lot of this trade is putting US money into the pockets of organized criminal groups and terrorist organizations, with all that that entails. In any case, if over half the material in the average ancient coin collection in the US contains illicit artefacts, in other words stolen artefacts, and the proceeds are going to finance criminal activity, is it really a wise move at this point in time for US ancient coin collectors to be suing the State Department as well as the Department of Homeland Security? Are US collectors so sure of themselves and their leaders that they can continue with impunity to collect no-questions-asked this kind of material, while at the same time pursuing the very bodies responsible in the US for prosecuting culture crime? How sure are they that such acts are not going to provoke for some of them at least a knock at the door at dawn one day like the rude awakening that awaited artefact-collecting residents of Blanding not long ago? If it happened that the US authorities will for once actually take decisive action to cut this canker from the fabric of civil society, I wonder how the ACCG would explain that to their members? .Vignette: coins on sale, who knows where they come from? But like many of the coins currently on the international market, they do not look much like they have been lying in a collectors' cabinet to me. In a post (More False Claims about Lobbying on Antiquities Issues ) on SAFECorner, Nathan Elkins discusses recent exchanges between preservationists and the coin dealer lobby, and particularly lawyer Peter Tompa. In it he fairly conclusively shows that all along that Bailey and Ehrenberg lawyer Tompa seems determined to misrepresent the true situation regarding the background to the Baltimore Illegal Coin Import stunt and the "test case" which uncooperative IAPN, PNG and ACCG coin dealers hope will overthrow the recent measures adopted for putting the CPIA into action. Accusations addressed to CAARI and its officers which are made into a key postulate of the "test case" are simply a conspiracy theory based on the weakest of "evidence" (speculation based on surmise and insinuation). The posturing of the ACCG and the dealers and collectors gathered under its umbrella is a pathetic attempt to deflect attention from the real issues. We should not however lose sight of the fundamental issue, all the verbal badminton that the divigations of people like Tompa and Sayles generate has as its aim to hide one fact. This whole affair is about the utter unwillingness of importers of ancient coins in the USA and elsewhere (the IAPN is an international dealers' organization) to respect the export laws of the countries from which they are buying them. Antiquity dealer and ACCG board member Dave Welsh (chair of the ACCG "International affairs committee") frankly acknowledges the "the distaste (and outright contempt) dealers have long felt" for the antiquities laws of other nations. Californian coin dealer Dave Welsh reposts the entire text of David Gill's discussion "Looting matters" of the Baltimore Illegal Coin Import stunt on his blog ("Going too far...")! In his reply he trots out the same old stuff the ACG has been saying all along, but does not explain why dealers in other types of antiquities from China and Cyprus are not taking part in this court action. In the absence of anything approaching any actual factual evidence that archaeological sites on Cyprus are really being looted to provide coins for US collectors, there is every reason to object to and legally challenge these far-reaching import restrictions. But then it is beyond dispute that the CPAC agreed that the restricting of imports of Cypriot artefacts into the USA would have a positive effect on reducing looting. it is in their report released by the FOI claim. The same one that it is planned to present as "evidence" in the upcomuing trial if it allowed. Welsh comments on David Gill's attitudes to this coin stunt: "raises a significant question, as to whether he views the narrow and parochial interests of archaeology being so transcendent that they necessarily trump all British and US common law, and also essential human rights of US citizens". And what of the attitudes of US coin dealers and collectors, do they not raises a significant question, as to whether they views the selfish, narrow and parochial interests of the trade in archaeological artefacts being so transcendent that they necessarily trump all attempts to protect the archaeological and cultural heritage of other nations by international cooperation and legislative measure and also essential human rights of the citizens of the countries affected by the destructive exploitation of their cultural heritage for commercial ends? Should this not be seen as a grassroots attempt of American citizens to claim the right to exercise their own colonialist ideologies at the expense of others? In a situation when it turns out that over a half of the ancient coins currently in private hands in the US according to a recent report are demonstrably recently and illicitly imported looted archaeological artefacts and not from the recirculation of material from old collections as so frequently claimed, then the attitudes of the coin dealers to mild measures intended to decrease the flow of illicitly exported coins from two countries affected by looting really raises a whole load of questions about the nature of this sorr trade. So much for the "old collections"
The reader might have observed that I am somewhat sceptical of the argument of the pro-collecting lobby that "unprovenenced does not necessarily mean looted" which reasons that "people have been collecting antiquities since the Renaissance" and postulates that antiquities from these old collections are the basis of the current market. This "Petrarch collected coins" assertion crops up as a frequent mantra in collecting circles, and it is a common accusation that preservationists like myself ignore it. This is mainly comes from the coineys, collectors of decontextualised ancient dugups. Sadly, it is not my side of the argument which is ignoring the implications of the data. Although the assertion is most often used to defend the collecting of unprovenanced ancient coins, it is precisely in this area that there seems to be evidence from two recently published sources that the view that material recirculated from old collections forms the basis of the current market is untenable. In a series of papers on the US market in ancient coins, Nathan Elkins discusses the evidence for the size of the market in freshly-excavated coins exported from the source countries like Bulgaria without export licences. One case for which he is able to give concrete details (most recently Elkins 2009, 483-4) is a series of shipments through Frankfurt airport, where officials established that one Bulgarian coin exporter between the end of the 1980s and March 1999 exported to the United States a metric tonne of coins through that one airport alone. This weight Elkins calculates is 350 000 coins. This is one airport and shipments of one dealer over about a decade. This was all going from just one country to the US market. We know there are other dealers exporting from Bulgaria as well as coins coming to the US through other airports from other source countries. But let us stick with that attested figure of 350 000 for the moment. This figure may be compared with the data for the overall holding of unprovenanced Greek and Roman coins owned by private collectors in the US given in the report "Project on Unprovenanced Ancient Objects in Private US Hands" published recently by the US Cultural Policy Research Institute. Here we read that in November 2009, the number of "unprovenanced Greek and Roman coins in private hands", was estimated by specialists to "likely number not less than 700,000 (200,000-300,000 Greek, 500,000-600,000 Roman)". Not less? But how much "not less"? Because if we accept that the total is 700 000 it means fifty percent of them were contributed by the 350 000 coins we know were exported by one Bulgarian dealer through one airport in one decade. There are however 30-50 people currently engaged in this trade in Bulgarian coins alone (Centre for the Study of Democracy... 2007, 186) thus the total number of illegally exported coins imported into the US over the past few decades which (if we assume that the coins comoing into the US are not simply evaporating when they get there) suggests that the majority of the "unprovenanced Greek and Roman coins in private hands" in the US are coming from recent imports of freshly-procured material from places like Bulgaria. This is the case even if we take the upper figure of 900 000 coins of the CPRI report. However one wants to manipulate these figures, the bottom line is that there seems not much room in the published CPRI figures for the material from old collections that the coin dealers' lobby claims is so prevalent in the market. By the way, the Ancient Coin Collectors Guild claims that in the USA are 50 000 collectors of ancient coins, if so, the overall figure of 700 000 means that on average, these "collections" contain no more than 14 coins each. Hardly enough to do any top-grade scholarship with, one would have thought. Something tells me that once it realises the problems wiuth the figure they gave, the CPRI is going to re-examine its published figures and revise them upwards. But since they have already published an estimate in their report, they will be obliged to explain the manner of calculation and to explain the discrepancy. Also of course there may be problems increasing the numbers, for once we get into the millions the "number of unprovenanced coins held in private hands in one country alone" starts to sound like a symptom of something really bad going on with the world's finite and fragile archaeological resource. Some collectors we know have hundreds of coins in their collection. We await with interest further developments in the numbers game. [my related post on the SAFE blog]. Elkins N. 2009: Treasure hunting 101 in America's classrooms. Journal of Field Archaeology 34(4), 482-489. Centre for the Study of Democracy, 2007. Organized Crime in Bulgaria: markets and trends, Sofia. Vignette: Petrarch (1304-1374) had impeccable dress sense and collected coins. GREEK OR ROMAN SILVER COIN, FIND IT WITH METAL DETACTORE, FROM OVER SEE, THE SIZE OF IT THE SIZE OF HALF DOLLAR, I DIDN'T CLEEN IT THEY TOLD ME BATTER NOT TO DO, I JUST TEST THE SIDE TO NOW IT'S SILVER YOU CAN CALEEN IT IF YOU WANT TO SHOW ALL THE SILVER IN IT, I AM NOW OVER SEE SO I WILL SHIP IT WITH IXPRESS MAIL, I WILL SEND IT ANY WHERE IN THE WORLD, YOU WILL GET IT WITH SIGNATURE, 100% SILVER, I DO HAVE OTHER COIN YOU CAN SEE MY LEST, I DO PUT THE ADD EVERY TIME I FIND ONE NEW. YOU CAN C THE FIRST PIC LOOK LIKE IT'S SMALLER THAN THE 2ND BUY IT'S THE SAME COINE JUST WITH THE SCAN ONE LOOK BIGER THAN THE OTHER, IT'S THE SAME COIN FROM THE FRONT AND THE BACK. The same studiously laboured language. Yet the seller's feedback shows he does not have these problems with formulating a sentence in English when he is selling gold bullion, cosmetics, mp3 player or a mobile phone. The coins offered are fakes, the first is a copy of a bronze sestertius of Maximinus I, probably Bulgarian in origin, the second is a tourist souvenir fake of a Ptolemaic coin. If one looks back at the seller's feedback he has sold a number of such items as from the "Middle East". It seems from the way the seller moves to a different written style to convince people that they are what he asserts, suggests he is well aware that these are not what he says they are. When was he going "overseas" to do this metal detecting, and has he got an export licence for the proceeeds? Apart from the fact that the current no-questions-asked market allows anyone to pass themselves off as a finder and legitimate owner of an ancient object, which could in fact have come from anywhere, and which allows abuses like this. What is particularly interesting here is the social perception of the metal detectorist in Pennsylvania. Both seller and buyer expect a metal detector using artefact hunter to be semi-literate and write as though he has a total of nine months in school to his name. Even fake coin sellers are poking fun at the tekkies' spelling. SpokenWord.org is a project of The Conversations Network, a (U.S.) 501(c)(3) non-profit. It is a service that helps web users find, manage and share audio and video spoken-word recordings. These are found elsewhere on the Web and submitted to the database by members, it thus serves as a directory and a search engine where one can find audio and video spoken-word recordings regardless of where they are published. A contribution posted there on 17th Feb 2010 was on "Illicit Antiquities: Repatriation and Curating". a media-savvy group of physicians and researchers from Cambridge University who use radio, live lectures, and the Internet to strip science down to its bare essentials, and promote it to the general public. Their award winning BBC weekly radio programme, The Naked Scientists, reaches a potential audience of 6 million listeners across the east of England, and also has an international following on the web. This is the sort of thing we need much more of. The podcast is an examination "of the darker world of black market archaeology; the programme discussed how illicit antiquities can be tracked down after being lost for decades and how they can be returned to their country of origin". There is also a mention of "Chippendale's law" on the antiquities trade, and a discussion of the Irish view by Richard Warner of the Portable Antiquities Scheme ("things like treasure hunting...." go on in England, not in Ireland, and how the Irish system encourages truthful reporting). One speaker talks of "heritage of place" which is worth deeper consideration. This is interspersed with information on the remains of fast food eaten in the original Globe Theatre in London, DNA studies of the migrations into North America, and the typology of post-Medieval gravestones in British churchyards. Well worth a listen (lasts 32 minutes). Naked Archaeology presenter Diana O'Carroll was chosen to represented the project when it received a European award for the best podcasts (interview here). Cambridge's 'Naked Archaeology' should not be confused with film producer Simcha Jakobovici who also labels himself 'The Naked Archaeologist', most known for his announcement of the so-called "Lost Tomb of Jesus" (which presented the controversial and ultimately untenable theory that the so-called Talpiot tomb was the burial place of Jesus' family). Vignette: Naked Archaeology logo; naked broadcasting photo from their website. I was talking the other day to somebody who quite possibly is one of the few people on the planet who has not already seen this video about the Medieval codex helpdesk and I promised to send her the link. I thought I'd put it up here because (a) I like it, (b) it is sort of archaeological and I'm sure if I really put my mind to it I could find a link between it and "heritage" or something, c) I've not included anything that moves here for ages, (d) its a good deal better than the puerile Ronny Barker video on another related blog. What is "the Truth About ACCG Test Case"? "The ACCG's officers and its legal team have failed to recognise that this sends out a clear signal to the rest of the world: some coin-collectors would rather put the acquisition of coins before the preservation and protection of the finite archaeological record". Absolutely. Rather than answer that, however, Tompa confines himself to complaining bitterly about "another misleading press release". The adjective "misleading" is not qualified by anything more substantial than an enigmatic observation "Gill confuses a Freedom of Information Act (FOIA) case with a separate action to test import restrictions". It is most unfortuinate however that Tompa does not explain more clearly what he actually means by that, certainly reading the actual text shows that, two quite separate legal processes are described by Gill. As I have said earlier it seems to me that the ACCG is engaged in nothing else at the moment than a desperate attempt to save face. Having squeezed several tens of thousands of dollars from their members, they now have to create the impression that they are getting somewhere in their fight to further liberalise the US market in dugup coins. They failed to get the conclusive evidence they needed to challenge the China and Cyprus MOUs from the FOI case, but staged the Baltimore illegal coin import stunt anyway and are going to court with a complaint full of speculation and innuendo - but little else. But they were asked, how does this show the world that the ACCG and the collectors it claims to represent actually DO care about their role in the preservation and protection of the finite archaeological record? Personally I think that the thousands of dollars from ACCG members in the coffers of that organization would be better spent on finding ways that collectors can help, rather than further hinder this process. Apparently art dealers are worried that the packages they send as cargo in commercial passenger planes will no longer be as immune from scrutiny as it has been until now reports the New York Times. It is estimated that that as much as 20 percent of art shipped around the world travels as part of the 13,000 tons of cargo a day is transported by passenger airlines. Since last February, airlines have been required to screen half of their passenger-air cargo (and, since late 2008, all cargo on narrow-bodied jets). But shippers say that several categories of cargo, including art, pharmaceuticals, high-tech equipment and perishable food, are almost always passed over when airlines have discretion because of the difficulty of searching such crates should an explosives-residue test or bomb-sniffing dog give reason to do so. Now, under new regulations made by the Transportation Security Administration beginning on Aug. 1, all items shipped as cargo on commercial passenger airplanes will have to go through the full airline security screening. Airline employees will now be able to open carefully crated works of art to search them the way checked baggage is sometimes searched now. Art-shipping experts say that the burden of the new regulations will fall more heavily on galleries and private dealers. John McCollum, the international shipping manager for Stebich Ridder International, an art-shipping company said another complication the art world would encounter involved the frequent use of anonymous parties in transactions. You’re a dealer in San Francisco and you’re trying to sell a piece that happens to be in a gallery in New York, and the buyer is in Paris, but the guy in New York, for all kinds of reasons, doesn’t want anyone to know that he’s the one selling the piece,” Mr. McCollum said. Because the federal government requires airlines to ensure that cargo comes only from known shippers — those who have filled out paperwork or been identified in other ways as being legitimate — such hidden parties in art deals will have a much more difficult time remaining hidden. “It’s going to be a mess,” Mr. McCollum said. Oh dear. And the no-questions-asked dealing and anonymous sellers does not lead to a "mess" in certain areas of the "art" world, like antiquities? Five Byzantine hagiographic frescoes dating from the 13th and 16th centuries stolen from a church thirty years ago returned to Greece from Basle, Switzerland at dawn Thursday. The priceless frescoes had been stolen by Greek antiquities smugglers from the Palaiopanagia Church in Steni, Evia in August 1978 and illegally sent out of the country. They were found by the Greek authorities (Athens Security Police Antiquities Smuggling unit) in 2006 in the hands of a "well-known Italian antiquities dealer", in a gallery he ran jointly with his German wife in Basel. Legal procedures for the return of the precious icons were begun by Greek authorities but they lasted more than two years, and sought the judicial assistance of the Swiss authorities for confiscation of the stolen paintings. Charges were reportedly brought against the antiquities dealer and all others involved. In December 2009, the Basle prosecutor's office issued a final judgement ordering the unconditional return of the frescoes to Greece. The frescoes depict Saints Ermolaos, Nikitas, Makarios of Egypt and Nestor, and are unique examples of the school of painting prevalent in the 13th and 16th centuries on mainland Greece. Palaiopanagia is a 12th century cross-shape roofed Byzantine church renowned for its exceptional art hagiographies that are distinguished for their precision of proportions and colors. The five stolen frescoes are a point of reference in international and Greek studies, outstanding among which is a 1971 study co-authored by the present Archbishop of Athens and All Greece, Ieronymos titled "Medieval Monuments of Evia", which has been awarded by the Academy of Athens. The study, in fact, was a key factor in definitively identifying the frescoes and positively establishing before the Swiss authorities that the five icons are protected Greek cultural monuments. This case illustrates that the turning of any piece of monument into a "portable antiquity" is only a matter of determination of the artefact hunters supplying the international commercial market in antiquities. These paintings were hacked off the wall and sold, even though they formed an integral part of a cycle which cannot be understood without seeing them in the context of the church itself and other decoration. The latter of course cannot be appreciated when these elements have been crudely removed for commercial gain merely leaving holes. What on earth would a collector buying such items say to "justify" that? Another disgusting element of this story is that despite the "exceptional" nature of the paintings, it seems nobody handling them between 1978 and 2006 was asking where they had come from. Not so as to get an answer. 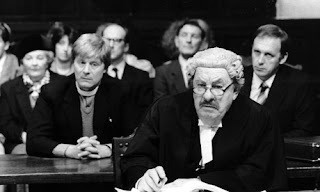 Still, even though the theft took place nearly thirty years ago, there is now a chance that those responsible can be at the least named and shamed and their more recent business dealings examined by the relevant authorities with a toothcomb to see what else they moved around "no questions asked". Glenn Howard (Ancient Art, Ltd.; Ancient Art International,Inc. ; Egyptian Antiquities, Westminster, CO 80036, USA) writes to the yahoo Ancient Artifact list that he was told (by whom I wonder) that the sale of his mummified human foot by Bob Dodge had "stirred a little attention and confrontation" on the list. He writes to tell the members his version of how it came to be on sale in the USA, the "real story behind this mummies (sic) foot....". The text he produces however is clearly crafted to offset the earlier criticism of fellow collectors, and is notable for what it does not say, as much as what it does. Neither is it explained why one dealer is selling another dealer's stock as his own. Let us see Mr Howard's retrospective justification for collecting human corpse parts. "I sorted them in three sections. Fake, authentic, and pieces I was interested in. Among the pieces were two mummy hands, and one foot (in an old Tupperware container). She proceeded to tell me she was going to throw them out. I was shocked by this. I wrote a check out and handed it across the table. I thought she was going to fall off her chair." One person's trash, is another persons treasured mummies hands (and foot), right? Anyway.... Now.... since then these have been cared for and kept from an certain destruction. I sold one of the hands to a collector that absolutely treasures it.I sold the foot in the auction that honest and well respected dealers Bob and Teresa Dodge worked so hard to make a great success.The last hand? I have have under a hand crafted redwood and glass display case in my private gallery. An interesting note, This hand has an original bronze pin holding the bandage gently into place on its palm. It is fascinating, and in an incredible state of preservation (I guess Tupperware really does keep things fresh!) Seriously. It may have helped in keeping this hand intact. To me personally.... this hand gives me some a the greatest inspiration,and thoughts this Egyptian culture has ever given me in 15 years.I wonder what this hand held [... snipped lengthy romantic speculation ...]? I don't think I will ever part with this hand.... It will sit beside me through life. I will instruct my estate to transfer this hand to a museum or a family member after I pass, as so they can be the next caretaker of this fascinating piece of history. Probably a family member of dear friend. Besides many of us know if would probably end up in an old metal chest down in the basement of a museum, if that's where I sent it. Just as bad as the trash. Not cared for as it should be. [...] So many of you should really think before you go on your insane tirades...". Mr Howard therefore has given the fragment of cadaver a "good home" (in a "a hand crafted redwood and glass display case" in his private gallery) and "saved" it [for now] from "an (sic) certain destruction". He uses it as his muse, an aid to entertaining speculation about the past. On his demise he intends to will a piece of somebody else's corpse to a family member or friend (as a memento?). He regards it as "insane" to question whether this is ethical collecting. What of course he does not say is what kind of "good home" he has assured for the foot he also bought at the same time and now sold on, through another dealer. It is not going to any "good home", it is going to the guy that came up with the most cash for it. That could be anyone, the piece could be going anywhere, to a freak show owner or foot fetishist, or a loudmouth drunkard Neo-Nazi wife beater given to smashing furniture perhaps. What actually is the US definition of a "good home" in which to lay to rest human corpses? In fact, whatever that definition is, neither Mr Howard or Mr Dodge seem to have taken any measures to 'vet' the bidders in the foot auction to make the "ensuring it goes to a good home" argument stick. But we note that in the text Mr Howard published on the collector's forum, the destination and type of "care" offered to the foot itself (that is what was being discussed) is mentioned only in passing. Let us look at his key argument that he saved it: "This would be buried in a landfill right now". The first point is that whether it is the uncaring heirs of one collector or another that dispose of items like this as trash, it still does not resolve the general issue of whether temporarily housing lopped off bits of human cadaver in ephemeral private collections (or with family members and friends of a deceased collector) is an activity which we should be applauding or decrying. Is it actually "insane" to ask such a question about the nineteenth century trophy-hunting attitudes of private collectors in the twenty-first century? I think not. Secondly I wonder whether in the US state where this woman lived it is legal and normal to dispose of human remains in the trash? Some guy's girlfriend's dead baby for example, grandma to save funeral costs, aborted human foetuses, human tissue from hospitals, the hobo that died of cold round the back of the garage. My guess is it is not. So is buying a bothersome artefact the only way to save it from somebody doing something illegal or unethical to it? Or is the motive for buying it the notion of a "handcrafted rosewood display case in my private gallery" and the potential for making 6000$ on the foot and an undisclosed sum on the hand, and the rest is retrospective excuse-making for this behaviour? The reader can examine the whole text and decide. Renfrew ('Loot, Legitimacy and Ownership') has examined the collectors' "good home" argument (2000, 20-1, 77) and concludes that it "may apply for stray dogs" but not antiquities. I think it applies even less in the case of pieces of dismembered human body, however much one might like to justify their acquisition in order to then ghoulishly stare at it on display in a personal gallery of decontextualised antiquities and speculate whose dismembered and scattered body it is a part of. Vignette: A collection of feet. "Jus' Becoz They're East Eurpeans?" Does Mr Ehrenberg believe... ? "Anti-collector Propaganda" in Scholarly Journal? CBA - The Mark of the Beast? Hardly. Antiquity Collecting and "The University Culture"
The Blood Antiquities of 9/11 Who Bought Them?